This will be our next challenge! Have you ever noticed that more and more brands have started using the “Aluminium free” magic words as a marketing tool lately? Well you know us, it may be aluminium free, but we won’t stop there as guess what? We still found a lot of other dangerous things in there. Is it safe for you to use? Propylene glycol: dangerous for those with kidney disorders; may cause transitory stinging and tearing; penetration enhancer which means it helps other chemicals penetrate the skin. And this is the first ingredient! water is a natural ingredient….of course! Sodium palm kernealate is also known as palm oil. As many of you may already know, this oil is a complete disaster for the environment and presents absolutely no benefits for your skin. This oil is used only in cheap soaps and cosmetics. Is an emulsifier derived from peanuts, used in soaps for exemple. Parfum (Fragrance), neurotoxic, strong irritants. Is a gum from a bushy plant that forms a gel when extracted. This substance helps bind ingredients together. This is a natural ingredient and there are no toxicity or health concerns. According to Environmental Working Group, some could be allergic to this substance. According to Truthinaging.com, this chemical is a generally mild skin irritant. a study published in Dermatitis entitled “Sorbitan Sesquioleate”, found that more and more people are allergic to this chemical. Is a natural fatty acid which can be derived from animals or from plants. Low concerns for its effect on the environment. Is an ingredient derived from nature. It could be animal or plant based. It is used as a thickener and emulsifier. This chemical is considered a nano particle. Preliminary scientific research has shown that many types of nanoparticles can be toxic to human tissue and cell cultures, resulting in increased oxidative stress, inflammatory cytokine production, DNA mutation and even cell death. They can penetrate cell walls, including organ tissues, and are known to be highly reactive. According to the truth in aging, The Cosmetic Database finds Sodium Silicate to be a moderately hazardous ingredient, and is classified as expected to be toxic or harmful, as a human irritant and as toxic to humans (I am not sure the use moderate is greatly justified here…). There are concentration limits for Sodium Silicate in cosmetics, and concerns regarding allergic reactions, organ system toxicity and irritation of the skin and eyes. However, ultimately, the CIR considers this ingredient safe based on assumption of low absorption (lets all go back to the first ingredients here…) . No studies were found that listed direct negative side effects from the use of sodium silicate in topical application. Is a chemical substance used as a fragrance for its floral smell. This substance is classified as an allergenic and irritant in Europe. Therefore, is regulated and limited. Allantoin is a natural compounds which has soothing and anti inflammatory properties. No records of irritation or allergies, it is therefore considered safe to use in cosmetic. Is known as an allergen which causes eczema for 3% of the population. Tests have been done only on a short period (2 weeks) on forearms (not on armpits). It’s a synthetic perfume which is ranked as hazardous in Europe and is part of the 26 allergen fragrance substances. It is also a synthetic fragrance used in perfumery to mimic the smell of Roses. It is ranked as hazardous in Europe. Is considerate to be a safe synthetic ingredient. Where is the logic we wonder…? Is a synthetized ingredient which mimics the fatty acid found in coconut oil. One more synthetic ingredient used in perfumery. This is a natural vegetal ingredient which helps absorb moisture. Is used in cosmetics to balance the Ph of the product. According to a European scientific study, this ingredient is used as a colourant and leads to organ toxicity, genetic mutation. It is therefore not allowed in higher concentration than 0,5%. A deodorant, by definition, is used on shaved fragile skin under the arms. 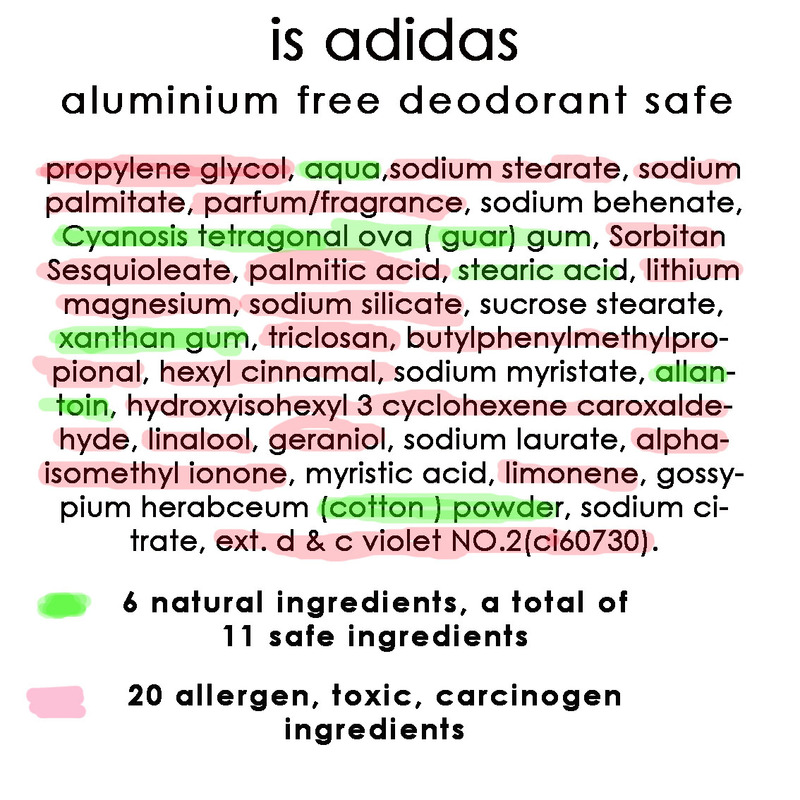 So this Adidas aluminium free deodorant? Ok so this deodorant doesn’t contain any aluminium. Still, it contains a lot of irritants, harsh and sometimes dangerous chemicals. On the top of this, the first ingredient actually makes other chemicals more easily absorbable by the body. For an easy and safe deodorant recipe, please follow this link deodorant with a candy flavour. Any questions or comments please let us know below! 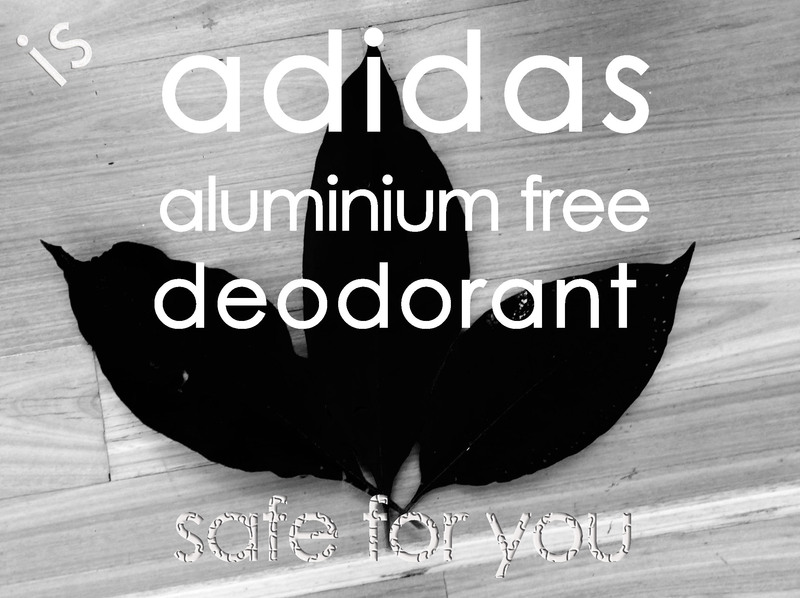 4 replies to Is the Adidas Aluminium Free Deodorant safe for you? Of course I am very honored if you reblog this post! Don’t hesitate!!! Don’t believe the hype! Marketing companies are quick to jump on the ‘Aluminium free’ band wagon but don’t let that hoodwink you into believing that the rest of their ingredient list is good enough for you. France’s great site is full of tips. This is a really useful post that explores each ingredient. Nothing like a little knowledge to take with you next time you hit the pharmacy.